This running vest/rucksack hybrid from Vaude hasn’t so much grown on me as clung to me. Incredibly form-fitting and stretchy in places where packs are usually rigid, once secured by the narrow chest and waist straps and with shoulder straps adjusted it really moves with your body, making it good for running, scrambling and mountain biking as well as general hiking. It’s also very, very comfortable. 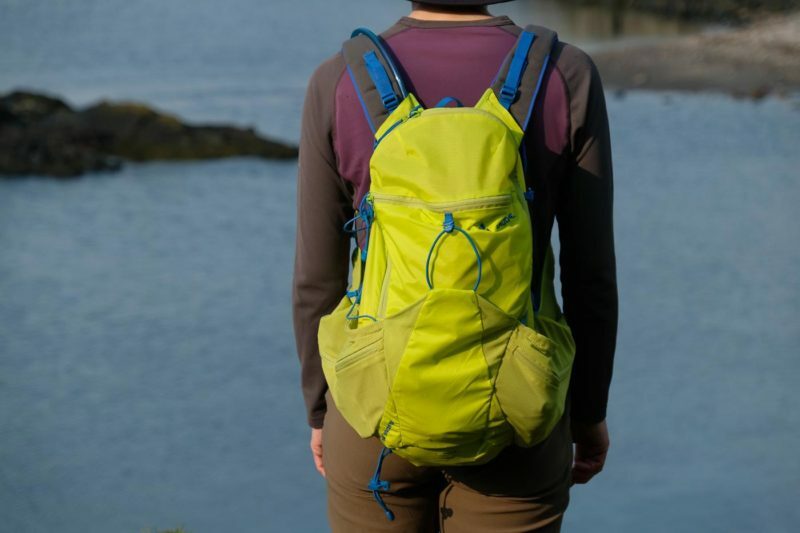 With a capacity of 18 litres, including the stretchy pockets at the sides and front, the actual body of the pack is just big enough for Scottish summer walking essentials. 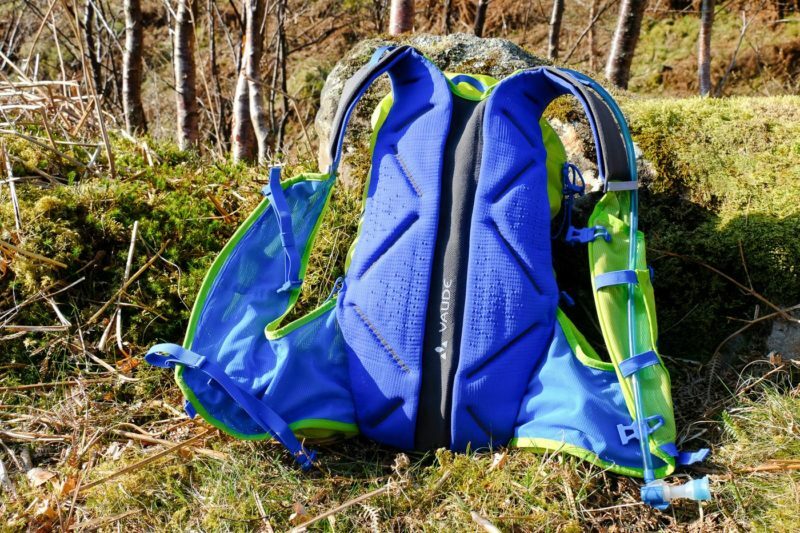 The design includes an internal pocket which fits a 2l hydration bladder. There’s an opening to feed the tube through and 3 elastic straps on the shoulder straps plus a plastic clip to hold it securely in place. There’s a decent sized internal zip pocket with key fob which will fit phone, wallet etc but not a map. Another larger external zip pocket on the front is a good size for easy access items. There’s an open front stretch pocket which can take a lightweight waterproof, though it’s slightly on the small side. The mesh side zip pockets are large and also provide sockets for water bottles that you can just about access on the move. The mesh vest pockets are stretchy and hold small items well. Runners and mountain bikers who want fast access to snacks, GPS, buff etc will like this design but it takes a little getting used to for regular walking. The real innovation comes in the shock-absorbing knitted back system for which the pack’s 8l sibling won an IPSO gold award in 2018. This means the back and shoulder straps are a one-piece knitted structure with no rigid parts. Whilst it feels spongy to touch, this works by trapping air between the stretchy knitted fibres which are denser at the top and bottom, taking more weight, and the back is less stiff in the middle. Vaude also says that this production method eliminates any fabric waste. As the pack hugs the wearer’s body so closely I thought it would feel hot and sweaty but that hasn’t been the case. I’ve worn it for my regular runs with a medium load and it’s proved more comfortable than my usual lightweight running-specific pack. There are two sets of ties for attaching poles, one position allowing fast access without taking the bag off – useful for hill runners. With no female-specific size it needs the chest strap to hold it in place, but this (and the waist strap) are fully adjustable as the clips slide up and down and stay in place. The sides have compression cords that can be tightened while on the move and these are effective in keeping the pack even closer to your body for high movement activities. When carrying only a small load and fully compressed it does mean there is a fair bit of spare cord hanging off the pack. There’s a reflective panel on the back and a light fixing point. It’s available in 2 colours, the other a muted grey. The fabric has proved tough so far and is reinforced at the bottom of the pack. Vaude – one of the most environmentally conscious brands – say it’s made with an eco-friendly, water repellent finish and is manufactured without the use of fluorocarbons (PFCs). The construction appears good with no wear and tear issues yet. All this innovation means a relatively high price for a pack of this size, but if you do a lot of fast walking, scrambling, mountain biking or running the pack is versatile enough to be used for all these activities. It provides a new level of comfort for a summer pack.